The Joys of Being A Student…. The week begins to go back to university, and like all other students has done NO work over the Christmas Holidays…. whoops! However, again, like all students I have excuses, and the majority is because I need to check back with lecturers and group members that the work is all right and going according to plan – which is a massive pain in the arse. I have my idea set, however, it’s still not in stone, which worries me.. a lot… the idea is typed up, with notes scribbled all over it of ways to perform it and execute it on camera to make it visually stunning and to show my skills as an actor and film-maker… however, the fact that it is not set in stone, is because I need to talk to my lecturer to make sure that the idea is going to get me a good grade, and it’s going ahead in the right academic format that is suitable to the module description and criteria. You have all seen the various blogs about ‘Attempts On Her Life’ for inspiration and such, and so I am going to form the ‘argument’ that it is a script that’s written for stage, it would therefore be an academic challenge for me to transfer those scenes onto screen, whilst staying true to what the scenarios are about, and showing them in a creative, metaphorical and expressive manner….. just hoping that that is enough to explore and attempt to create! My plan was to develop the idea further over Christmas, however, although I have thumbs up from a tutor that lead my for a few lessons before Christmas, the main lecturer has to give the over all thumbs up go sign in order for me to be able to continue on confidently with this project. Development work will take place as soon as I get the seal of approval! I am feeling relatively confident about this module, as things are progressing well. Despite the set back on filming before Christmas due to the weather, I am keen and geared up to get the Pilot film finished, and move on to shooting the 10 min film. Looking forward to our first filming date on the 15th of Jan, where we are kicking off with Scenes 1 and 2 of the Pilotand hopefully will be filming with an atrium graduate camera man (Gavin Owen), and my course mate, who is a keen camera man Colin Butcher fingers crossed they will be able to offer some good feedback and an extra creative output for the project, which I still have high hopes for! After the Pilot has been completed, I will be writing to DARE and Cardiff Council to gain their support for the project, providing that the Pilot is up to a good standard and the project is going extra smooth, as not to make a fool of myself and disappoint professional companies. Ideally I want this to be shown on a wider scale as possible through viral format…. Deadline for the Pilot is the 28th of Jan, so watch this space!!! Well, pretty much the majority of my life at the moment has been consumed by this tiny module. The London trip is well under way, with e-mails sent yesterday to Megabus, St.Christopher’s Hostels and CoachHireConnections (Private Coach Company) asking for quotations on prices. After initial quotes will I then enquire about discounts for using the trip as a marketing and advertising platform with the video diary being made, and sheer amount of blog post’s across facebook, twitter and wordpress that I seem to write about it. As well as YouTube, Flickr and what not – I just hope that this works out for the best. 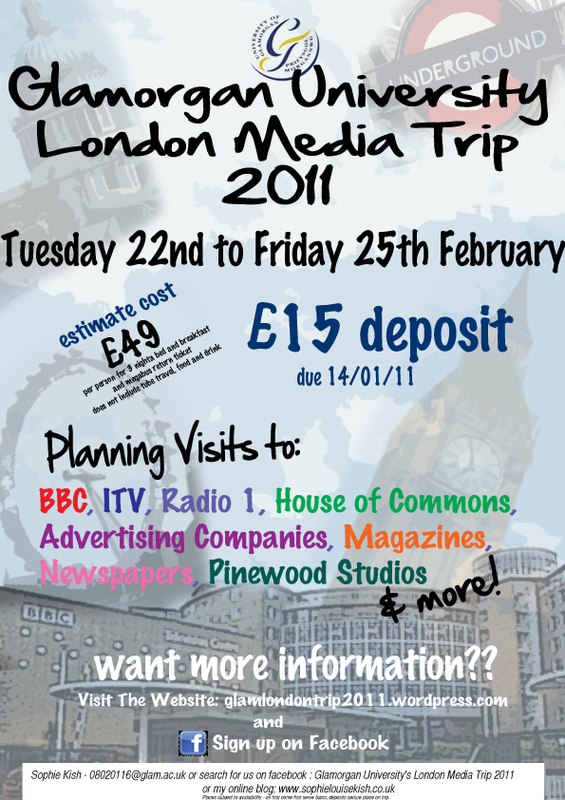 To all those reading this blog, who are interested in attending the trip, remember that the deadline for deposits is Friday 14th of Jan, with the form which you can access through the website Glam London Trip and no deposits or places can be given once this date has closed. P.S You also need to write your names, student IDs and other information down on document on the facebook page!!! After this I can then move on to a meeting with all the attendees of the trip, to get more information about how long people want to stay for, who wants to go where, and what rooms people want to stay in. Ideally I need to do this in the next 2 weeks, along with getting in touch with all the places to get guided tours, talks and secret passes! I’ve decided that it is all a waiting game, and due to the bad weather before Christmas, waiting just isn’t for me right now! Although this isn’t really a ‘part’ of the module as such, I do get kudos for doing work experience towards my ‘minor special project’. After doing my work experience at Warwick Emanuel in November last year, I’ve managed to arrange some work experience for myself on the 12th of Jan with a digital media company called Atticus, this time round doing some photoshop work for a website, and hopefully more days to come, doing lots of exciting stuff! This ‘placement’ was purely down to luck after I served the Director and his staff a meal at my place of work for Christmas Dinner, and was chatting to them about my future and the offer was placed on the table…. it does serve, it’s not what you know, it’s who you know!